Start truly appreciating the Here and Now effectively and naturally with hypnotherapy, and realize the incredible positive impact that can have on your life as a whole! Steve G. Jones, Ed.D., Clinical Hypnotherapist, charges $1,500 for a custom recording and $25,000 for a one-hour private hypnotherapy session at his office. But you can get all the benefits for this low price. Simply listen to the Appreciating the Here & Now Hypnosis MP3 every night as you go to bed for three weeks and feel the changes happening in your life. You will feel more empowered, more in touch with your true self, and you will truly know that your goals are within your reach. Steve G. Jones achieves AMAZING and LASTING results!!! Hypnosis is the easiest way to affect change in your life because the positive messages go straight to your subconscious mind effortlessly so you can accomplish your goals and reach for the stars!! All you have to do is listen to the Appreciating the Here & Now Hypnosis MP3 session at night as you go to sleep!!! You’ll hear soft music, the gentle sounds of the beach, and the soothing sound of Steve G. Jones’ voice all working together to bring about positive changes in your life easily and naturally. Steve G. Jones has been helping people improve their lives with hypnosis for over 17 years…now it’s time for him to help YOU… don’t wait, do it NOW !!! you’ll be glad you did. See you at the top! It seems as though there are two types of people: people who dwell on the past and people who dwell on the future. I think we should put an end to both of those types of thinking! Instead of wanting to change things in our past and wishing for a brighter future, why don’t we all appreciate the here and now? We definitely can’t change the past and we also can’t predict the future. Appreciating our current lives seems to be the most important thing. Although it might seem that things are going exactly your way in your life right now, I would like for you to take a minute and think about all the great things that are going for you right now in your life. It is important to think about and appreciate all the good things you have. And as you continue to relax you imagine a world where only the present exists. This place can be where ever you would like. It can be in your home or outside; it can where ever you want it to be. Go ahead and create this very special place. This place is filled with things that you enjoy. These things make you happy. In this special place, there is no past or future to ponder over. You focus all of your attention and energy to the present. If there are things going on around you in your special place, you take notice. You appreciate these things. These things enrich your life more than you can imagine. You are no longer constantly thinking toward your future. You enjoy your life right now. You live for the moment. You do not dwell on past successes or failures. None of that matters in your special place. Look at all the wonderful things going on around you. You are motivated by the things that go on around you. They fill your life with joy and a sense of calm. Now picture your normal day to day life. Go ahead and transfer all the appreciation you have while you are in your special place and apply it toward your life. You now live a new life that is richer and more fulfilling. You take time out of your day to notice the little things. You find yourself smiling more at things that you never used to smile at, that’s right. Your entire attitude has changed. You are more positive. You realize that life can only truly be enjoyed in the present. Picture your normal daily routine. Perhaps you are at work or in your home. You are interacting with people and enjoying it. You take pleasure out of the different conversations you have with people. Common routine tasks that you perform everyday are no longer mundane for you. You appreciate your ability to get things done and you enjoy being purchaseive. You enjoy the relationships that you have with family and friends. You realize how much they mean to you and how they play an important role in your life. You lead a very fulfilling life. Now picture your life one year from now. Picture yourself in your home. Look at the smile on your face, you are very happy and satisfied with your life. You no longer look at your past with either positive or negative thoughts and you no longer dwell on your future. You live for the moment everyday. And day by day you find that more and more you notice the little things. Each little thing that you notice makes you smile and fulfills your mind, body, and soul. You appreciate the relationships you have around you. You have meaningful relationships with family, friends, coworkers, and acquaintances. But most importantly you have a fulfilling relationship with yourself. You are no longer negative. Instead, you focus on the positive, vastly changing your life for the better. You realize that you are worthy of all the successes that come your way. You appreciate the good that comes out of your life. And you see all the good that you create. You are a caring and confident person. You enjoy you life right now the way it is. You still have hopes and dreams, but you realize that the most important thing is the present and you appreciate all the wonderful things that occur around you. All around you your life is happy. You are happy, the people around you are happy. You improve the lives of the people around you with your thoughtfulness. You appreciate the here and now and that feels absolutely wonderful. Hypnotherapy is a great tool to use to rearrange your way of thinking. Instead of focusing on the past or the future, hypnosis will train your mind to focus on what is currently going on in your life. You will no longer feel the need to bring up past occurences, because you will realize that the past is the past. Many people focus on the future. Whether you believe great things are going to happen in your future or bad things, it is more important to focus on the here and now. You have very little control on the future unless you focus on the present. The Appreciating the Here & Now Hypnosis MP3 audio will target your subconscious mind so that you no longer feel the need to dwell on the past or future. You are in charge of your life. You will enjoy all that life has to offer if you focus on the present. Hypnotherapy will make you more consciously aware of what is going on around you. Your perception of the world will be heightened. Appreciating the here and now will have a profound effect on your life. You will be a happier person and a more positive person. You will realize that by focusing your attention on the present, more will be opened up for you in your future. You will truly be amazed at the results hypnosis will give you! Life is all about the present. You cannot go back in time so there is no point in focusing on the past. Whether you would do something differently in your past does not matter because you cannot get it back. What you do have is the present. The here and now is very powerful and anything is possible. The only thing you truly have charge over in relation to your past, present, and future, is the present or the here and now. This powerful hypnotherapy program helps you appreciate your life for what it is right now. You will no longer feel the need to dwell on the past or on the future because you will realize that the here and now is the most important. 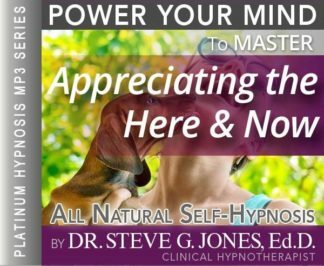 We suggest you listen to this empowering Appreciating the Here & Now Hypnosis MP3 download for 21 nights in a row. You will start to see positive changes in your life right away! You will begin to appreciate your surroundings for what they are, in the present. You will be amazed at how much you can benefit by the Appreciating the Here & Now Hypnosis MP3 program.